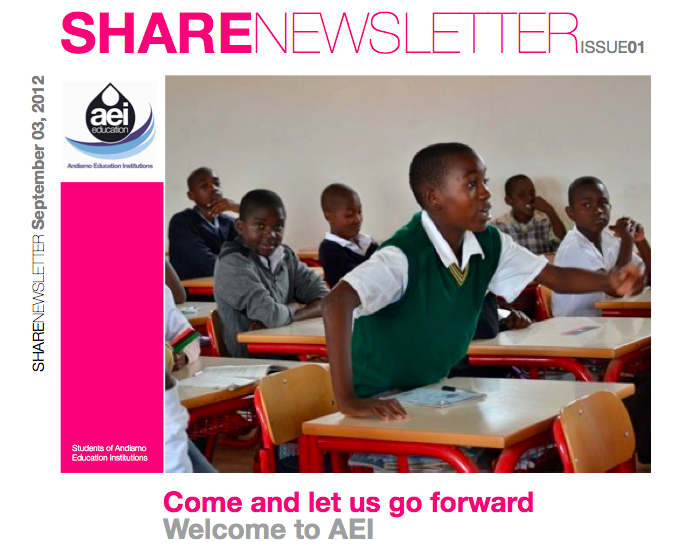 The first ever Andiamo Education Institutions (AEI) newsletter called Share is out and students will receive it on the day of arrival. The first edition has articles from Fr. Mario Pacifici, Patrick Bwanali, Valeria Giassi and Alessandro Marchetti. The next edition will have also articles from the students themselves. This entry was posted in Education, News from Malawi and tagged Andiamo Education Institutions, Andiamo Schools, Education, Fr.Mario Pacifici, Malawi, Patrick Bwanali, Share Newsletter. Bookmark the permalink.